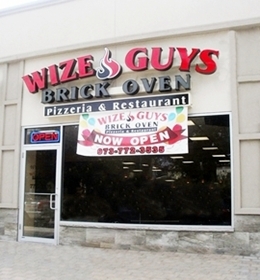 Visit Our Beautiful New Clifton Location With Brick Oven Pizza! As Always You Can Count On Quality Food & Friendly Excellent Service. Get Your Piece Of The Pie Now! Great Food At Great Prices. Bring The Whole Family! So Much Great Food We've Got You "Covered" Every Which Way You Might Want To Go. You Can Thank Us Later! Hand Scooped & Soft Serve Ice Cream, Sundaes, Shakes, Blasts & Much More. This Is One "Big Chill" You Won't Want To Miss! Get The Best Pizza. Get Wize! Hot & Fresh Brick Oven Pizza. Build Your Own Or Try One Of Our Specialty Pies! "To Die For" Salads, Pizza, Pasta, Sandwiches, Seafood & More! We Cater Any Size Event. Hey, you talkin' to us? Good! Come Visit Us Or Order Online. Either Way, You Can Always Rely On Great Food & Fast Friendly Service. Call Us Or Order Online. We Deliver! Place Your Order Online With Just A Few Clicks Of Your Mouse. If there are any problems or you are unhappy in any way with your order, please call us immediately. We will do our very best to resolve the situation in order to ensure your complete satisfaction up to and including a full refund!